To create a new scene, just drop an image. You can create up to 128 scenes. 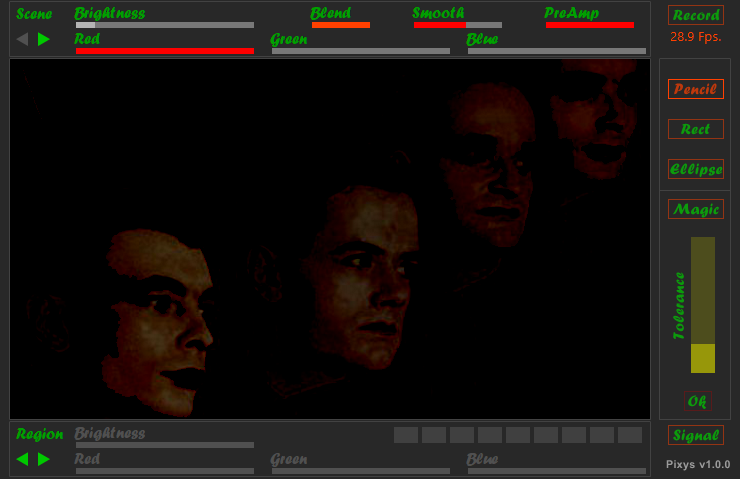 Each scene responds to a midi program change message. A scene has 1 picture and an unlimited number of regions. You can change the brightness and colors of the picture. Other properties are pre-amplification and how smooth the regions will react to the audio frequencies. The blend knob lets you choose between colorful and natural. Regions are created by means of the tools on the right side. With the pencil tool you can freely draw a region on your picture. Other tools are rectangle, ellipse and the magic wand tool. With the magic wand enabled, just click on an area of your picture, adjust, if needed, the tolerance and click ok.
An existing region can be selected with the arrows on the bottom left or by clicking on it with the pencil tool. Regions vary between two states. With the signal button you select the state. This will show their appearance when there's no audio signal and when the audio signal is at it's max. You can change the brightness and colors. You can choose between 9 frequency bands. Above each band is a small rectangle showing the amplitude. Right clicking on a selected region will remove it from the collection. To record just click the record button and start the transport of your Daw. Videos will be saved in the sub-folder of where you installed Pixys. It's called [pixys_video]. The video's are named automatically. [pixys_xxx.avi]. If you want to choose another video codec, [Control]-click record.